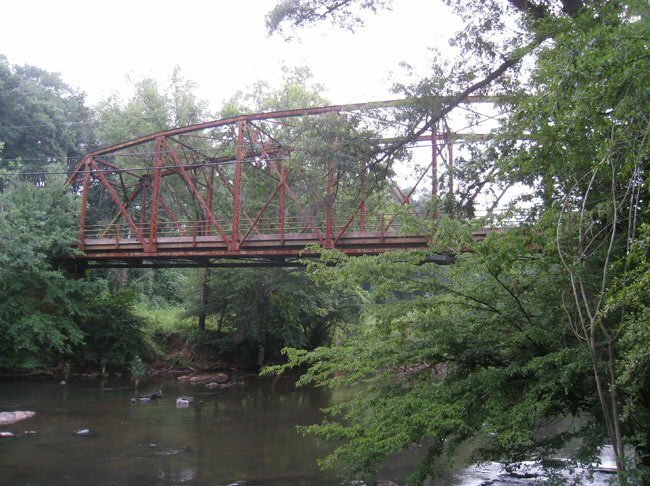 Built in 1929, the Old Dunham Bridge is a steel truss bridge which stretches over the Saluda River in Greenville County. It is located near present-day SC 81 and was once along the main route from Downtown Greenville to Anderson. This bridge was still being used into the late 1990s. The bridge is one of the last remaining steel truss bridges in the state that still has its complete structure intact. Now it can be accessed by the adjacent Dolly Cooper Park on the Powdersville side of the Saluda or the Greenville side by walking or riding a bike. The chain link gates at either end of the bridge are now unlocked and open, so yes you can walk across it. Can you actually walk on the bridge? What about the really old Dunham bridge, which was a covered bridge? ?